Cooperation between Leader Local Action Groups (LAGs) in Poland & Austria aims to promote local food products via a series of events and to help register food products in official databases in order to formally establish their market presence. Local food products provide important income sources for rural areas and can also help to reinforce an area's cultural identity which can be harnessed as an economic driver. Seven Polish and one Austrian LAGs joined forces to run a cooperation project based on finding new ways for promoting local food products. The project encouraged local food producers to apply innovation during the promotion and distribution of their goods through participation at fairs and markets in both Poland and Austria. The project aimed to promote an inclusive approach to ensure the full cross-section of local food producers were involved. Long-term goals focused on registering local food products with the Polish authorities so as to formally establish their market presence. Leader funds were used to pay for the costs involved in producing promotional material about local food products from the eight LAG areas. Help was also provided to encourage producers to participate in new distribution channels and experiment with direct sales during a series of project events. A dedicated website was established and advisory services were also used to help register local food products as unique foodstuffs. Local food from the LAG regions was widely promoted and the producers were able to see the benefits from investing in rural development techniques such as direct sales and quality marketing. 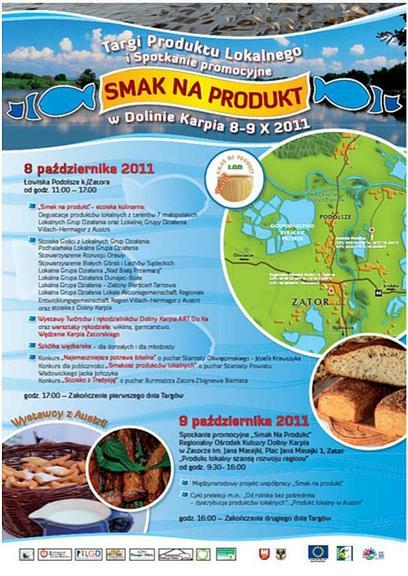 The zator carp fish is an example of a distinctive local food product that was participating in the project which has now been registered with the EU under 'Protected Designation of Origin' (PDO) status. One of the LAG's involved used area branding for its 'Carp Valley' products and this approach proved both popular as well as productive with participants. All of the LAGs acknowledged the importance of inclusive approaches to their actions and special attention was paid to involving elderly farmers in the rural development process on this project. See the project website (https://www.smaknaprodukt.pl) for the LAG territories involved.